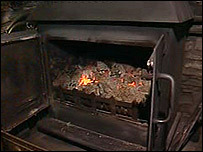 A scheme designed to help vulnerable people make their homes warmer has been criticised by a Devon politician. Geoffrey Cox, the MP for Torridge and West Devon, said some contractors selected by the Warm Front project were charging more than the grant. Raymond Brewer from Chillerton received a grant of £2,700 for a new boiler, but was asked to pay an additional £1,000. But the company which manages the scheme said contractors were vetted and all quotes robustly scrutinised. Eaga said prices for work had been standardised and it was happy with the quote given to Mr Brewer. Warm Front is funded by the Department for Environment Food and Rural Affairs. Audrey Stacey, who lives near Tavistock was given a grant of £4,000 to replace her leaking coal-fired boiler with a new oil-fire one. But the pensioner said she was "staggered" when she received her quote from the approved contractor. "For the work that's involved, we were asked for an extra £2,760," she told BBC News. "It was just beyond belief, so I rang round other contractors and found we could have the job done for less than the £4,000 grant." Mr Cox said he had received several concerns from constituents and also from various housing associations. "These top-up fees are simply preventing people from having access to what is a worthy scheme," he said.